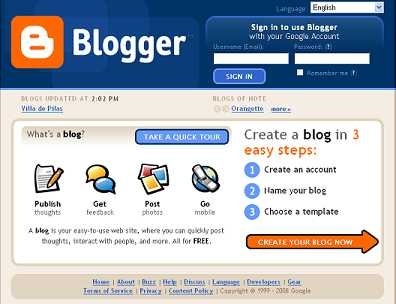 There are many ways in which you can create a blog, the easiest being to use a blog host such as Blogger or Wordpress.com. Using these, you can create your blog on any topic you want and even customize it to suit your needs to a certain extent. I say 'to a certain extent' since no blog that is operated from a blog host's website can ever be truly yours, and you consequently have limited control over the design and occasionally even the content of your blog. That is because neither the software needed to manage the blog, nor the files that hold your content, are contained on your website, but on that of somebody else. That 'somebody else' is either the operator of Blogger or of Wordpress, or whatever blogging host you happen to be using. So what does that mean to you in practise? I have no intention of going over the pros and cons of the hosted versions of Wordpress and Blogger, and have provided a link on my website that provides that information for you, but it should be clear to anybody that if you host your own blog from your own website, you have much more control and latitude in the design, formatting and content of your blog. It is not difficult to upload Wordpress to your website and run it from there. You can then upload any number of the multitude of plugins and templates available to enable you to design your blog in any way you want. You can change the appearance and content not only of your navbar, but can use html to change practically every aspect of your blog to suit your needs. The question you will be asking is how you get Wordpress onto your own website. It is easier than you think. Wordpress.org provides the software, and you have to upload it to your website into a directory of your choice. The easiest way is to use an ftp client, and you can get information on good free ftp software on my website or blog. You then have one or two alterations to make to some of the files and you are done. You have a blog that you can change to suit your own needs without any of the restrictions that are imposed by the Wordpress website. You can change the template to any of the thousands on offer online, either free or paid, and you can also use software to design your own or to customize the templates to your own design. You can change the whole look and feel of your blog, and offer whatever links that you feel necessary. You can put whatever adverts on it that you want, including AdSense blocks, and use your blog to make you money. Creating a blog is easy, and if you know how to create a blog exactly as you want it, then you will have a great tool at your disposal that you can use to promote any product you want, and also to make direct sales, either of products or of advertising. There are many ways in which you can use it either to promote products or to earn money through advertising. You have few restrictions when operating a Wordpress blog from your own website; all you have to know is how to do it. Once you know how to create a bog on your own site, you can harness the power of blogs to achieve what want to achieve with your website. There are few limits and your imagination will be your major asset, so use it. To learn how to create a blog on your own website and how to use your blogs to make money, check out Pete's website Create A Blog where you will not only be given links to websites that can help you, but also useful Blogging Tips.